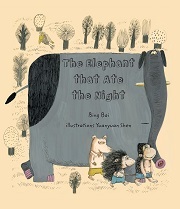 Mikka Anja Haugaard at Everything with Words has bought, from Jieli Publishing House in China, UK rights to The Elephant That Ate the Night by Bing Bai and Yuanyuan Shen. Bing Bai has won several literary awards, and is also Jieli's editor in chief. The Elephant That Ate the Night is for children aged 2-5. The elephant of the title swallows up the night through his trunk - but then the animals become too tired to play, and the tigers lose their roars. Everything with Words will publish on 15 November.